Light, crisp, and with a stunningly deep flavour. Crackers are a convenient snack, and these universal low-carb and gluten-free ones can find a place in any diet. Most important, however, is they taste delicious. It’s been a challenge for me to find a variety of snack foods that fit into a healthy diet. I have no problems with making exceptions, eating occasional junk food, but I’d still been lacking a healthy snack variety. Thus I’m quite happy to have a relatively easy cracker recipe. This is actually my second one; somehow I haven’t got around to posting the other flax crackers — which taste entirely different. 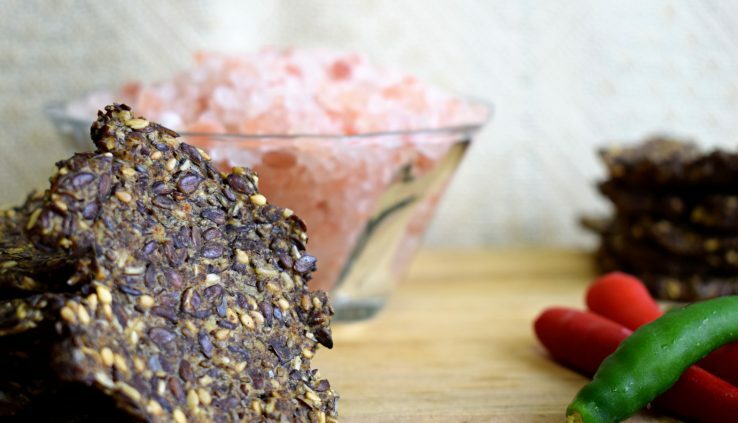 The recipe calls for ground flax seeds. Getting the correct term here caused a bit of an issue. Ground can mean anything from slightly chopped up, to ground into a powder. The powder, or flax flour as I call it in other recipes, is definitely not what you want here. I’ve settled on saying “partially ground” flax seeds. I’m reasonably confident this would work with whole flax seeds, but I have not tried it. The rice flour works as a binding agent and gets quite crispy. It’s a high carb ingredient, but there’s little of it. We don’t need to eliminate all sources of carbs to have a good diet. I’ve chosen baking soda, instead of baking powder, as an early reaction would be problematic. You don’t want the dough puffing up while still trying to flatten it on the cooking sheet. Though if baking powder is all you have, give it a try and let me know. The crackers will still be lovely if puffier, or flatter. These combine well with hummus or a spicy dill quark. Mix the ground flax seeds, chia seeds, and water in a large mixing bowl. Let the mixture rest for 20 minutes, allowing the seeds time to absorb the water. Mix all the dry ingredients in a separate small mixing bowl. Pour the dry ingredient mix into the wet seed mixture. Add the olive oil to the combined mixture. Spread onto a sheet of baking paper on a baking tray. You can wet your hands and pat it down, or use a wet spoon. I'd avoid a rolling pin, as it sticks easily. Try to get it as thin as possible without holes, about 2-3mm thick. This will likely spread to the edges of the tray. Try to have a consistent thickness so it cooks evenly. Using a knife, or pizza cutter, cut a grid through the dough, making bite-sized pieces (about 3-4cm on the sides). Bake in oven for 20-30minutes until hard. Test them by touching the middle of a cracker with your finger. If it is soft then leave it a bit longer. Take out the tray and let the crackers cool. You can break them into pieces along the knife-cut lines.